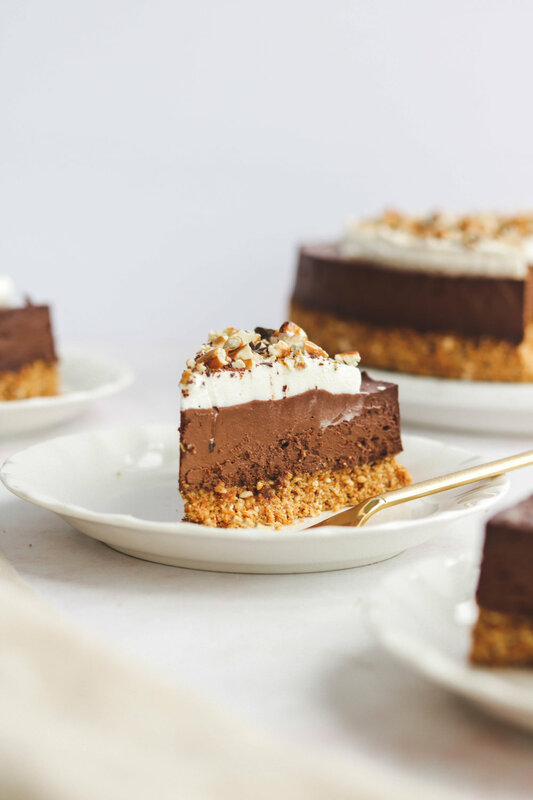 This Vegan Chocolate Silk Torte is paired with a crunchy Peanut Butter Pretzel Crust. 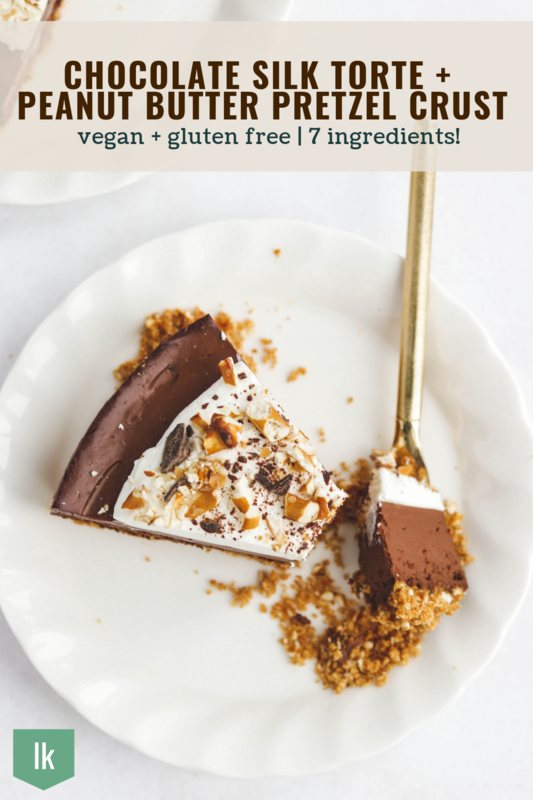 Only 7 plant based ingredients needed to make this decadently delicious vegan & gluten free chocolate dessert! Happy February! I feel like February is the unofficial month to celebrate one of the best things in the world: chocolate. It’s when everyone is hunting down the best richest or on-sale cheapest chocolate 😂. And also when everyone is waiting for the end of the month when all the chocolate goes straight to the clearance section. Well friends, today I’m sharing the first (of many) chocolate recipe of the month: Chocolate Silk Torte with a Peanut Butter Pretzel Crust! It’s uber rich and lush, let’s go! This chocolate decadence requires only 7 ingredients! Seriously, it’s so easy. All there is to it is processing the crust down, putting it into the oven for a couple minutes, melting some chocolate, blending the rest of the ingredients and then pouring it over the crust! To be honest, I think the hardest part is waiting for it to chill. This Chocolate Silk Torte is amazingly glorious in every way- it’s chocolatey, creamy, and rich. And then with the combination of a slightly salty crust thanks to the pretzels, a truly harmonious dessert. You can eat it just like that, but to make it extra special I topped it off with some non-dairy whipped cream. The cream is light and fresh and helps add an extra (very highly recommended) yum-factor. I seriously hope you guys give this a go! Not to mention, it would be a solid choice for a valentines day dessert ;). For a NO BAKE version, replace the rice malt syrup with dates. Press down the crust and place into the fridge while making the filling. Use GOOD quality dark or semi-sweetened chocolate for a silky, rich texture. I’ve done this with cheaper chocolates and it just isn’t the same! When taking the torte out of the pan, use a knife to go around the edges before lifting it from the bottom. When slicing the cake, pour boiling water into a long tall glass, then dip the knife into the water for a couple seconds and immediately slice the cake for the perfect cut. 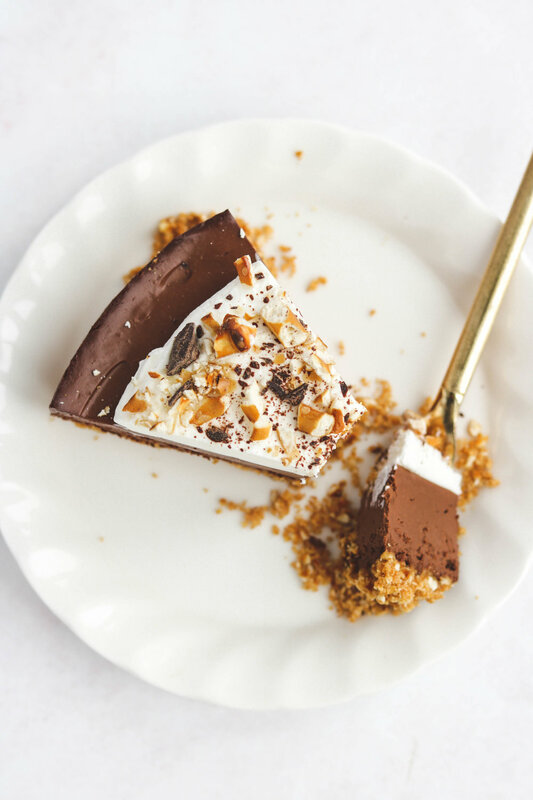 If you recreate this Chocolate Silk Torte with Peanut Butter Pretzel Crust please share it and let me know what you think by tagging me on Instagram @lisakitahara, I love seeing all of your tasty recreations! Pre-heat the oven to 350. Add pretzels into a good processor and process until crumbly. Add in the peanut butter and rice malt syrup and pulse until you can pinch the mixture with your fingers and it sticks together. Once the crust has come out, allow it to cool, then pour over the chocolate filling and allow it to chill for at least 1 hour (best overnight)! Optional: Spread a layer of coconut whip cream over the top and sprinkle with crushed pretzels and shaved chocolate.